This recipe is a great way to enjoy some lighter flavors while still staying satisfied through the cold weather. 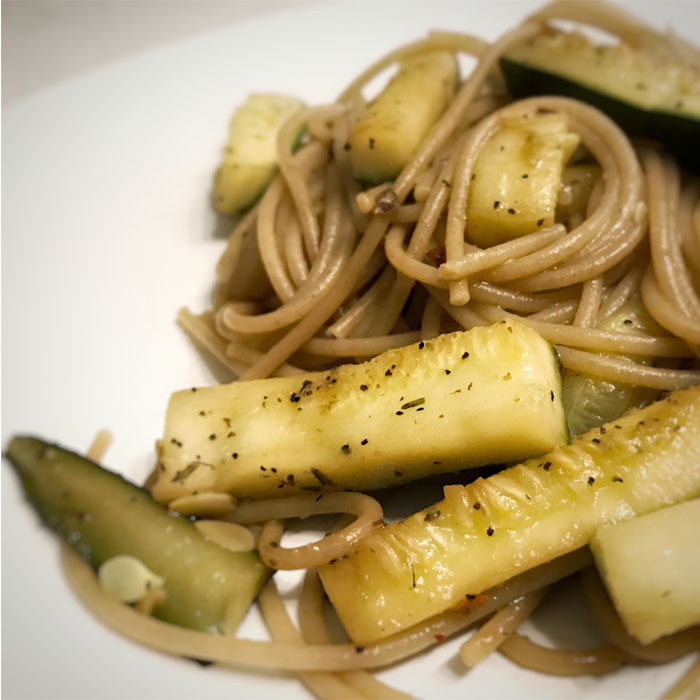 This dish combines the flavors of zucchini and lemon with our Pastmore Artichoke Rosemary Linguini. A drizzle our of Pastamore Fig Balsamic Vinegar would make for a nice finish to your pasta dinner. 1. Rinse zucchini and cut off top and bottom. Julienne squash and set to side. Thinly slice onion. 2. Heat a large pot of water on the stove over high heat. Once boiling, add the Pastamore Artichoke Rosemary Linguini. Cook until al dente. 3. Heat a large pan on the stove over medium-low heat. Once hot, add olive oil, onion , and zucchini. Cook until browned and season to taste with salt, black pepper, and red pepper flakes. Add 1-1.5 cups water from cooking pasta. Reduce sauce. 4. Add sauce and pasta to large pot. Mix well and adjust seasoning as needed. Plate pasta and top with a large squeeze of lemon juice.